Ian Doescher’s stellar work on the Star Wars saga is something no fan of Literature or Star Wars should miss, and we have gloriously received another example of this in The Empire Striketh Back, Doescher’s latest addition to the Star Wars mythos. 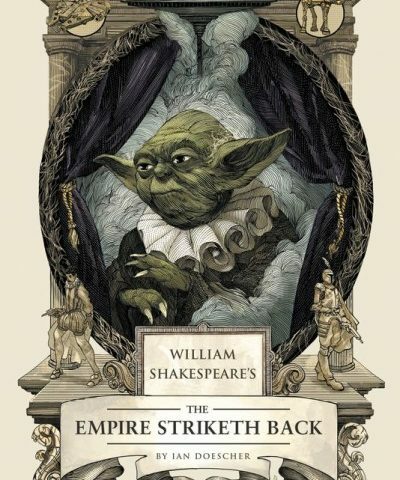 As with William Shakespeare’s Star Wars, Ian incorporates the muse of Shakespeare to give voice to one of the beloved films in the Original Trilogy. Episode V is ripe for the Shakespearean treatment, as the darkest film in the Original Trilogy has many of the qualities that make a great Shakespearean tragedy. By sending robot probes to aid his wrath. It’s beautiful, spot on, and lovingly embraces the saga, while elevating the language to a place that is figurative and powerful, and resonates with both Star Wars fans, as well as Shakespearean scholars. Perhaps what is most unique about this series is that through the power of Shakespeare’s soliloquies (Shakespeare revels the inner thoughts, feelings, and desires of the characters to the audience, without the other characters being aware), we learn more about these beloved characters then ever before. Not only do we hear the inner thoughts of the Wampa, and AT-AT’s, but Artoo’s soliloquies reveal a complex, intriguing character capable of much more than boops and beeps. It is truly fascinating to explore these characters in elevated, figurative language, and Doescher delivers on all accounts. Luke: We shall not rendezvous with our friends yet. And what we shall meet there, time shall unravel (2.4.41-43). We know the scene, up to the dialogue, musical queues, and sound effects (the odds are good that you are replaying the scene in your mind right now), but through the lens of Shakespeare, we experience the poetry of Episode V in new and exciting ways. As with William Shakespeare’s Star Wars, this truly is the perfect blend of style, substance, and fun. Not only will you find yourself engaged in Lucas’ classic film in new ways, but you will be able to step into the world of Shakespeare through a galaxy far, far away. It is a beautiful testament to the power of language, storytelling, and creativity, and no one does it better than Ian Doecher. Naturally, there are people out there who (perish the thought) are not fans of Shakespeare, but find themselves curious as to how the book could interpret Shakespeare’s style, while remaining accessible to those fans out there who aren’t Literature Majors. The good news is that The Empire Striketh Back does deliver, providing an exciting new way to enjoy Star Wars through poetic, engaging speech that reveals new insights into these iconic characters and themes, while giving us the right amount of Shakespeare to the casual fan. Ian mentioned to us on his first appearance on Coffee With Kenobi that he hopes his interpretations of the Bard will inspire a curiosity into the world of Shakespeare that instills a passion for the world’s most famous playwright. Not only does he succeed on all accounts, but he will have you waiting at your local bookstore for The Jedi Doth Return July 1st. I wouldn’t miss it for the world. Note: A big thank you to Quirk Books for providing an advance copy to review. Next article Melinda's Brew : Oh, For A Bacta Tank! Previous article Spend May the 4th at Rancho Obi-Wan! I do like to hear and watch Shakepeare, but not to read it. I always dreaded those particular reading assignments (ducks as tomatoes are thrown)! Perhaps being done as Star Wars would change my mind – I just might have to try. It sounds like a really great piece of work. If this were performed as a play, I would be all over it! I loved this book–maybe even more than the first. It truly provides insight into the characters and scenes (Is Leia using latent Force abilities to sense Vader on Bespin before he reveals himself? Is Han being tortured because his pain will cause Luke’s visions on Dagobah?) And it’s hilarious (the royal “we” conversation and the discussion about every structure having perilous shafts were particularly funny to me). Ian’s at the top of his game and his favorite character, Han Solo, gets the royal treatment here. 5/5 stars indeed.